If you ask any financial advisor they will tell you that bankruptcy should be considered the very last resort as a way to deal with credit card debt and other debt you may have accrued. The effects of a bankruptcy can be felt for a long time. However when all other avenues have been explored and still no solution has been found declaring bankruptcy is sometimes the only way that an individual can ever hope to get a fresh financial start, even though it will be at least 5-7 years before they can ever hope to be considered for traditional credit again. In the United States there are two primary types of personal bankruptcy: Chapter 13 bankruptcy and Chapter 7 bankruptcy. Either kind must be filed as a case in a federal court and it does cost several hundred dollars to do so, in addition to an attorney’s fees. In the case of Chapter 13 bankruptcy individuals who still have a steady income are allowed to keep assets they may have otherwise lost – their home, their car, their furniture. Under a Chapter 13 bankruptcy agreement the federal court judge approves a structured repayment plan that allows an individual to use their future income to satisfy their current debts within a set three-to-five-year period, rather than having to lose any of their property or other important assets. After all the payments have been made according to the agreement then the judge will declare the debts, and the bankruptcy, discharged. Chapter 7 bankruptcy is a far more drastic measure. Under Chapter 7 bankruptcy the federal court can take all of an individual’s liquid assets, with the exception of things like basic household furniture and essential work tools, and either turn them over to creditors directly or have a court appointed official sell them off to satisfy debts. This form of bankruptcy is usually not discharged for seven to eight years and has far more of an impact on your credit record. 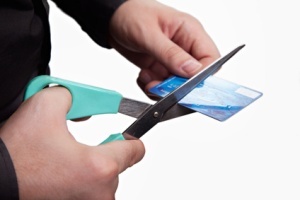 Is It Worth Considering Bankruptcy to Solve Credit Card Debt? There are few people who file for bankruptcy just because they have credit card debt, however high that debt may be. Credit card debt is unsecured debt. Credit card holders do not have to stake their home or their car to get a credit card and those things cannot be taken away from them if they run into debt trouble in the way that your mortgage lender can try to foreclose on your home. Instead for most people credit card debt is just a portion of their debts and they may also be facing foreclosure or very large medical bills, two of the biggest reasons people consider such a drastic step. If you do decide to declare bankruptcy your financial life will change significantly as a result. Those who do file for bankruptcy will find that getting a loan of any kind, even a small personal loan will be extremely difficult for the first few years after bankruptcy and anything other than a secured credit card is certainly out of the question as is, in most cases, a mortgage or home loan. If you filed a Chapter 7 bankruptcy it will not drop off your credit report for 7-10 years, less of course in the case of a Chapter 13 filing but that does involve meeting the repayment schedule set out by the federal court judge to the letter. There are some things that an individual can do to lessen the impact of a bankruptcy though and although it is a slow process declaring bankruptcy does not mean that you will never get a mortgage, car loan or credit cards again. Apart from paying all of your future bills in full and on time and maintaining an income in order to be able to do so you will want to think about slowly rebuilding your credit. A secured credit card can be very useful here but only if used very carefully. After getting the secured credit card you should make small regular charges to it to establish a usage pattern that the credit bureaus can track but then pay off the balance in full and on time every single month. Something as simple as putting a few tanks of gas on your credit card that you would otherwise have paid for in cash may sound insignificant but done on a regular basis will begin to rebuild your credit score (even though the bankruptcy will still show). There are some lenders out there who offer personal loans, car loans, credit cards and other loan products that will declare in all their advertisements that “bankruptcies are OK”. You should be very cautious when considering these offers though. The rates of interest charged on these credit cards (which are usually sub prime) can be very high and in the case of a personal loan or car loan they can be downright exorbitant. It is far better then to rebuild your creditworthiness slowly and steadily. In many cases that will mean driving the same old car for years instead of getting a brand new one and getting used to life without a wallet full of credit cards. It also may mean living in rented accommodation instead of buying a house just yet. However if you can demonstrate this kind of fiscal responsibility eventually you will be able to obtain credit again.